Bailey McCarthy's bedroom in the latest issue of Rue. I spy Leontine Linens and the most perfect shade of mint green on her walls. I love that shade of green - so nice with the pink and the blue. And the bed canopy is attainable if you put on your DIY hat. Wonderfully well done sleeping quarters. Have a lovely weekend. See you Monday! Mint green with hints of hot pink so pretty for a spring day.Have a great weekend. 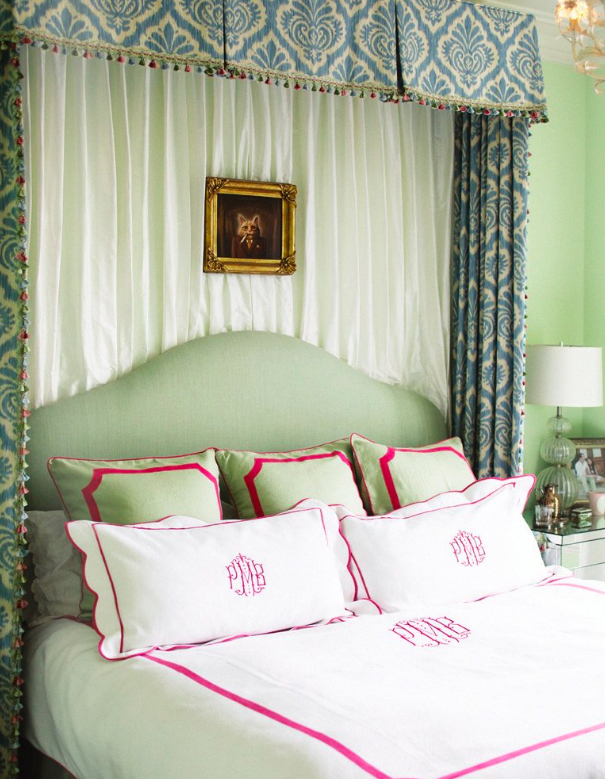 Although I would not have put the monogram on the shams in addition to the coverlet, it is a lovely, fresh bed and achievable as a DIY project. Gorgeous! I can't see having a white coverlet in my house (with a german shepherd that sleeps on the bed), but that room is beautiful!